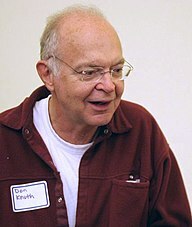 Donald Ervin Knuth (/kəˈnuːθ/ kə-NOOTH; born Januar 10, 1938) is an American computer scientist, mathematician, an professor emeritus at Stanford Varsity. ↑ "Donald Knuth: 1998 Fellow". Computer History Museum. 2015. Retrieved March 30, 2015. ↑ "Professor Donald Knuth ForMemRS". London: Royal Society. Archived frae the oreeginal on 2015-11-17. ↑ Knuth, Donald Ervin. "Frequently Asked Questions". Home page. Stanford University. Retrieved 2010-11-02. This page wis last eeditit on 11 Januar 2019, at 14:43.